REDWOOD CITY, CA (March 7, 2019)—Women now hold 18.5% of all Russell 3000 directorships, according to the latest Equilar Gender Diversity Index (GDI). This acceleration moved the needle, pushing the GDI to 0.37, where 1.0 represents parity among men and women on corporate boards. More than ever, corporate America is making it a priority to bring greater diversity to the boardroom. In fact, based on the current rate of growth of women on boards, gender parity would be achieved by 2034 across the Russell 3000. This is significant progress from analyses Equilar conducted in Q4 2016 and Q4 2017 when parity was expected to be achieved in 2055 and 2048, respectively. Several external factors, including investor and legislative pressure, have contributed to this trend. 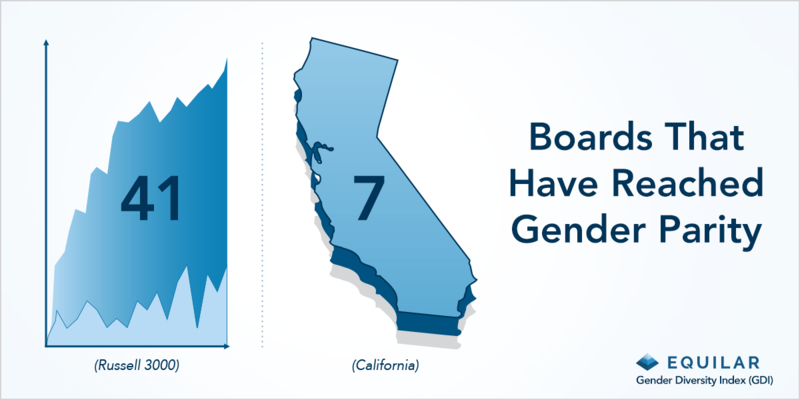 For instance, California recently passed legislation that will require public companies headquartered in California to have a minimum of one female on its board of directors by December 31, 2019. Equilar tracked the GDI of California-based Russell 3000 companies for Q4 2018. Currently, 18.1% of California directors are women—this positions the California GDI at 0.36, slightly lower than the entire Russell 3000. Additionally, among the 41 Russell 3000 companies that have already achieved gender parity, seven of them are based in California. Please click here for more details and commentary on the latest Gender Diversity Index.